Y.-S. Ma has been a full Professor of the Dept. of Mechanical Engineering since 2013 with the University of Alberta. Dr. Ma has also been a registered Professional Engineer with APEGA, Canada since 2009. Currently he teaches capstone design projects, engineering economics and manufacturing processes. 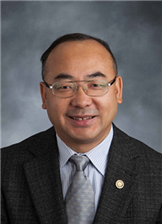 His research areas include interdisciplinary heavy oil recovery production tooling engineering, feature-based product and process modeling, plastic molding simulation and mold design optimization, CAD/CAE integration, CADCAM, ERP informatics modeling, and product lifecycle management. Dr. Ma received his B.Eng. degree from Tsinghua University, Beijing in 1986, M.Sc. and Ph.D. degrees from UMIST, UK in 1990 and 1994 respectively. Before joining U of A, from 2000 to 2007, he had been an Associate Professor with Nanyang Technological University, Singapore; and from 2007 to 2013, with University of Alberta. He served as an associate editor of IEEE Transaction of Automation Science and Engineering from 2009 to 2013; and since 2012, has been an editor of Advanced Engineering Informatics. Dr. Ma won ASTech award sponsored by Alberta Science and Technology Leadership Foundation jointly with Drader Custom Manufacturing Ltd in 2012. He started his career as a Lecturer from Ngee Ann Polytechnic, Singapore in 1993, and then from 1996 to 2000, he was a Senior Research Fellow and Group Manager at Singapore Institute of Manufacturing Technology (SIMTech).